Irish composer and song writer, Sue Furlong, was born in 1962, in Waterford (Port Láirge), Ireland’s oldest city, and home of Waterford Crystal. In 1987 she moved to Wexford, where she enjoyed a busy life with her husband and two boys. 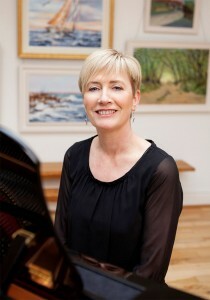 Sue’s early years as a composer saw many pieces published by GIA, and in 2001, her “Mass of Thanksgiving” won 1st prize in RTE’s (Ireland’s State broadcaster) National Church Music competition. Commissions in the late 90’s and early years of the new millennium brought about a change of direction in Sue’s work. “The Dancing Master” , a spectacular children’s choral cantata, commissioned in 1995 by Rosaleen Molloy of County Wexford Children’s choir, sparked an extensive career in composition for children. In 2005/06, Boosey & Hawkes published Sue’s collection of 40 Irish songs, “D’Aon Ghuth”(With One Voice), Volumes 1,2 and 3. Boosey & Hawkes also published a selection of songs from “The Dancing Master” called “Peace Songs from County Wexford” in 2006. “D’Aon Ghuth” songs are widely used across the spectrum of music education in Ireland, and are regularly heard at children’s choral festivals. Prestigious children’s choirs, such as “Aspiro” (Carlow), and “Appalachian Children’s Chorus” (West Virginia), commissioned Sue to write works to suit their talented choirs. Resulting choral classics, “Our Deepest Fears” and “Mo Ghile Mear” are representative of Sue’s talent for writing quite challenging choral works, suitable for both young and more mature voices. In 2008, Boosey & Hawkes invited Sue to submit five Christmas songs in a popular style for their publication “The Little Cradle Rocks”. Other composers whose songs featured in this Christmas volume were Christopher Norton and Andrew Milburn. One of Sue’s most exciting commissions came as a result of works she had included in Boosey & Hawkes bestselling “Singing Sherlock”, a singing resource for Primary Schools. Renowned vocal and choral specialist, Val Whitlock, asked Sue to write a musical for children, on behalf of Solihull Music Service, Birmingham. “The Voice Thief”, (coming soon to Sue Furlong Music) with songs scored for orchestra, was subsequently performed at Birmingham Symphony Hall in 2010, with an 800 strong cast of children from Primary Schools across England. Sue’s catalogue of works also includes arrangements of a very diverse nature for mixed voice choirs, such as Duke Special’s “Last night I nearly died”, as well as arrangements of well known Irish folk songs, “Bheir mé ó”, and “Beidh Aonach Amárach”. As conductor of Wexford Festival Singers from 1998-2006, Sue undertook two courses of choral conducting studies with Dr. James Jordan, Weston Noble, Bruce Chamberlain and Charles Bruffi, at Westminster Choir College, Princeton, USA. In 2007, Sue founded a mixed choral group called Vocaré, which became a multi award-winning choir. With a repertoire ranging from Bernstein’s “Chichester Psalms” to Thin Lizzy’s “ Don’t Believe”, one of Vocaré’s winning performances earned them an invitation to perform in the Carnegie Hall debut of American composer, Carol Barnett’s, “Bluegrass Mass, The World Beloved”. Sue retired as conductor of Vocaré choir in order to pursue her career in composition. In December 2016 Sue was sadly diagnosed with cancer, and passed away after a brave fight with this dreadful disease in January 2018.